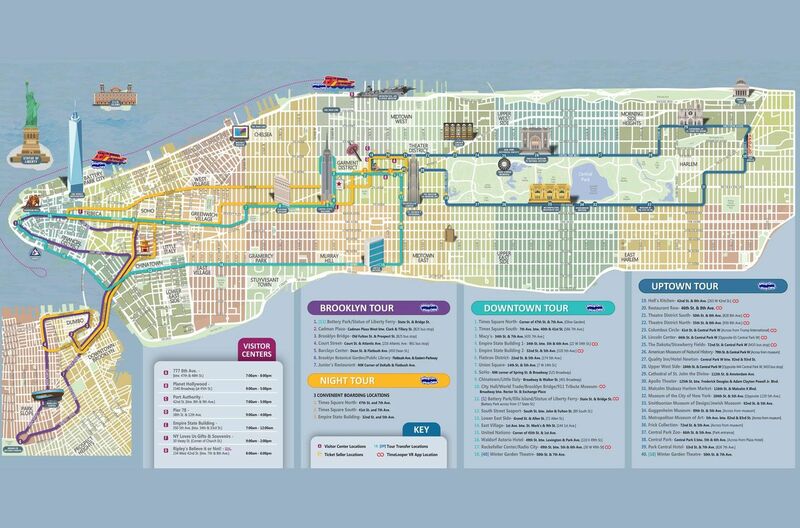 Hop-On, Hop-Off Tour: Downtown route buses have frequent departures from 8:00 a.m. to 6:00 p.m. You will be able to collect a timetable which shows the times for all lines and attractions when you redeem your voucher. Helicopter Tour: Flights are available from 9:00 a.m. to 6:00 p.m. You can either give your preferred start time in the special requests field at the time of booking or call the operator on arrival in New York to plan your time slot. Hop-On, Hop-Off Tour vouchers must be exchanged at 777 8th Avenue, between 47th and 48th Streets. You must print and surrender a paper version of your booking voucher for both tours in this combo (showing your voucher on a smartphone is not accepted). No refund can be given to customers without a printed copy of their voucher. The Night Tour is not Hop-On, Hop-Off.